With a series of important events over the last 5 days, the city of Paris has been witness to the material transnationalisation of the radical democratic movements that began this spring in Maghreb and the Middle East. Thursday, May 28th between 300-400 Tunisian exiles arrived in Paris, France. After having travelled for over 45 days – from Tunisia to the small Italian island of Lampadusa where they had been initially held by Italian authorities and overcoming the French government’s attempt to block trains entering France from Italy – this community of migrants made a makeshift camp at a small park on the exterior of the French Capital. Almost immediately, the police welcomed these young migrants – predominantly young males no older than 25 – with mass arrests, militarily invading the Villette Park where they were staying and launching a citywide manhunt. Between Friday the 29th and Saturday the 30th over 100 arrests were made, including at least 4 minors. Following the arrival and persecution of the Tunisian migrants, Parisian activists – notably the Front de libération populaire tunisien (FLPT) Coordination des Intermittents et Precairs (CIP) and Knowledge Liberation Front (KLF) – began organizing in order to find safe havens and supply basic needs (food, shelter and medicines) for the new arrivals. Representatives from leftwing parties and unions also began concerning themselves with the urgent situation. However, after several grassroots meetings, the Tunisian community made clear that they did not want any (colonialist) charity from French organizations but rather a stable and safe place where they could exercise their right to self-organize. They vehemently insisted against any political manipulation of their situation by the institutional left. A last minute decision to participate in the traditional demonstration for the 1st of May was made in order to bring attention to their situation and to gather the Parisian community of Tunisian together. The demonstration was a huge success. Hundreds of Tunisian migrants created the most lively and politically decisive blocks of the otherwise traditional march. The block was lead by a huge white banner that read “No Police Nor Charity: A place to organize” signed by “The Tunisians from Lampedusa to Paris”. Carrying ad hoc placards and signs that read “Ben Alì, Murabak, Sarkozy…” and “We’ve come to help you do the same” the message was clear: the Maghreb wind of radical democratic change has arrived in Europe. Despite continuing police repression and the attempts of the institutional left to coopt the burgeoning movement, on the night of May 1st well over 200 migrants and activists (now officially organized as the Collective of Tunisians from Lampedusa) occupied a building in the 19th arrondissement of Paris. Although the police arrived almost immediately at the scene and attempted to enter the building and arrest the occupants, an overnight sit-in outside and physical resistance inside has so far managed to prevail over any eviction. Currently, the City of Paris is now trying to conduct negotiations between the occupants and the national government and police. Tonight an activist meeting has been called to continue this new mobilization. But one thing in sure: this autonomous, transnational and grassroots movement has no intention of giving up their right to self-organize nor will they fall into the trap of political manipulation by the institutional left. We, the student and precarious workers of Europe, Tunisia, Japan, the US, Canada, Mexico, Chile, Peru and Argentina, met in Paris over the weekend of the 11th-13th of February, 2011 to discuss and organize a common network based on our common struggles. Students from Maghreb and Gambia tried to come but France refused them entry. We claim the free circulation of peoples as well as the free circulation of struggles. In fact, over the last few years our movement has assumed Europe as the space of conflicts against the corporatization of the university and precariousness. This meeting in Paris and the revolutionary movements across the Mediterranean allow us to take an important step towards a new Europe against austerity, starting from the revolts in Maghreb. We are a generation who lives precariousness as a permanent condition: the university is no longer an elevator of upward social mobility but rather a factory of precariousness. Nor is the university a closed community: our struggles for a new welfare, against precarity and for the free circulation of knowledge and people don’t stop at its gates. Our need for a common network is based on our struggles against the Bologna Process and against the education cuts Europe is using as a response to the crisis. Since the state and private interests collaborate in the corporatization process of the university, our struggles don’t have the aim of defending the status quo. Governments bail out banks and cut education. We want to make our own university – a university that lives in our experiences of autonomous education, alternative research and free schools. It is a free university, run by students, precarious workers and migrants, a university without borders. This weekend we have shared and discussed out different languages and common practices of conflict: demonstrations, occupations and metropolitan strikes. We have created and improved our common claims: free access to the university against increasing fees and costs of education, new welfare and common rights against debt and the financialization of our lives, and for an education based on cooperation against competition and hierarchies. •	We call for common and transnational days of action on the 24th-25th-26th of March, 2011: against banks, debt system and austerity measures, for free education and free circulation of people and knowledge. •We will create a common journal of struggles and an autonomous media of communication. •We will promote a great caravan and meeting in Tunisia because the struggles in Maghreb are the struggles we are fighting here. •We will be part of the G8 counter-summit in Dijon in May. •We will meet again in London in June. Fighting and cooperating, this is our Paris Common! Noi, studenti e lavoratori precari d’Europa, Tunisia, Giappone, USA, Canada, Mexico, Chile, Perù e Argentina, ci siamo incontrati a Parigi dall’11 al 13 Febbraio, 2011 per confrontarci e organizzare un network comune basato sulle nostre lotta comuni. Agli studenti dal Maghreb e dal Gambia è stato impedito di partecipare, perché la Francia ha rifiutato loro l’accesso. Noi rivendichiamo la libera circolazione delle persone e la libera circolazione delle lotte. Negli ultimi anni i nostri movimenti hanno assunto l’Europa come spazio di conflitto contro l’aziendalizzazione delle università e la precarietà. L’incontro di Parigi e i movimenti rivoluzionari che attraversano il Mediterraneo ci permettono di fare un importante passo avanti verso una nuova Europa contro l’austerità, a partire dalle rivolte nel Maghreb. Noi siamo una generazione che vive la precarietà come condizione permanente: l’università non è piu un ascensore per la mobilità sociale, ma una fabbrica di precarietà. E l’università non è un luogo isolato: la nostra lotta per un nuovo welfare, contro la precarietà e per la libera circolazione dei saperi e delle persone non si ferma ai suoi cancelli. Il nostro bisogno di una rete comune è basato sulla nostra lotta contro il Processo di Bologna e contro i tagli all’istruzione che l’Europa sta usando come risposta alla crisi. Dal momento che gli interessi pubblici e privati collaborano nel processo di aziendalizzazione dell’università, le nostre lotte non hanno l’obiettivo di difendere lo status quo. I governi salvano le banche e tagliano l’educazione. Noi vogliamo costruire la nostra università – una università che viva nelle nostre esperienze di autoformazione, ricerca autonoma e nel libero accesso. Si tratta di una università libera, gestita dagli studenti, dai lavoratori precari e dai migranti, una università senza frontiere. Questo fine settimana abbiamo condiviso e discusso con diversi linguaggi pratiche comuni di conflitto: manifestazioni, occupazioni e scioperi metropolitani. Abbiamo creato e arricchito le nostre rivendicazioni comuni: il libero accesso all’università contro l’aumento delle tasse e le spese di istruzione, un nuovo welfare e diritti comuni contro il debito e la finanziarizzazione della nostra vita, e per una formazione basata sulla cooperazione contro i processi di gerarchizzazione. Convochiamo i giorni comuni transnazionali d’azione del 24, 25 e 26 MARZO 2011: contro le banche, il sistema del debito e le misure di austerità, per il libero accesso e la libera circolazione delle persone e dei saperi. Costruiamo una rivista comune delle lotte e un mezzo di comunicazione autonomo. Organizziamo un grande carovana e un incontro in Tunisia, perché le lotte in Maghreb sono le lotte che stiamo combattendo qui. Ci incontreremo di nuovo a Londra nel mese di giugno. Prenderemo parte alle mobilitazioni contro il G8 a Digione in maggio. Lotta e cooperazione, questo è il nostro comune di Parigi! The Battle for Lazoughli Square ??????? ????? ??? ????? ???????? This interview with Egyptian revolutionary socialist journalist Hossam el-Hamalawy was conducted on Saturday, February 5th at 8pm (Egyptian time). Due to time limitations we were only able to address half of the questions we had prepared. Below el-Hamalawy comments on the current decisive moment faced by those on the streets of Egypt, working-class participation and action, and the role of the army amongst other topics. The situation in Egypt is developing incredibly fast, can you describe what’s happening in the streets right now? It’s raining in Cairo now, it’s very cold but the protestors are holding out and more from the other provinces, specifically from Suez, have descended on Cairo to join the occupation today. In the meantime the government is continuing with its witch-hunt and demonization campaign against the protestors, blaming them for whatever malaise the country is going through at the moment which is actually the fault of the government and not the protestors. This follows twelve days of continuous protests starting on the 25th of January. The 25th of January is National Police Day here in Egypt and that’s when the protests actually started. The Egyptian government wanted to basically liberate the Liberation Square, Tahrir Square, from the protestors today. And they started that in the morning but they have failed. It has been announced that tomorrow the government will resume work and they have called on all civil servants to attend to their jobs and to go to their factories. They wanted to smash the occupation of Tahrir today. But as I’m talking to you that occupation continues. What are some of the hurdles the protest movement is facing, are there divisions emerging while trying to find common ground? Yesterday the square was completely packed with more than one million protestors and Alexandria witnessed similar protests as well as the other provinces. But there are definitely big problems that the protest movement is now facing. Which way is the way forward? Today it has been announced that Gamal Mubarak and Safwat El-Sherif, who is one of the most hated figures and was the secretary general of the National Democratic Party, will be removed from their positions and one of Gamal Mubarak’s associates, Dr. Hossam Badrawi was to take the secretary general position instead. There was also news that appeared on Al Arabiya, BBC and Al Jazeera that Hosni Mubarak had resigned as the president of the NDP, but of course not from his post as President. But now there is confusion because these reports have been denied, then confirmed again and then denied, so we are waiting to see. It is true that virtually all the opposition groups, whether they are the traditional political parties or the youth groups, have taken part in the uprising but the protests still remain spontaneous. Which means on the one hand, the people always surprise you by their militancy from below that exceeds all expectation, but on the other hand, there is always confusion about what is the way forward and what the clear alternative is. This could pose the threat of this revolution being hijacked. At the moment we have many people claiming to represent the downtown occupation and some of them are even engaged in negations with the government. Some groups say they will not negotiate until Mubarak goes, some think that if Mubarak goes we can negotiate with Omar Suleiman [vice president appointed by Mubarak on January 29th, ex-director of the Egyptian General Intelligence Services and the CIA’s go-to-guy on rendition], others say both Mubarak and Omar Suleiman have to go. 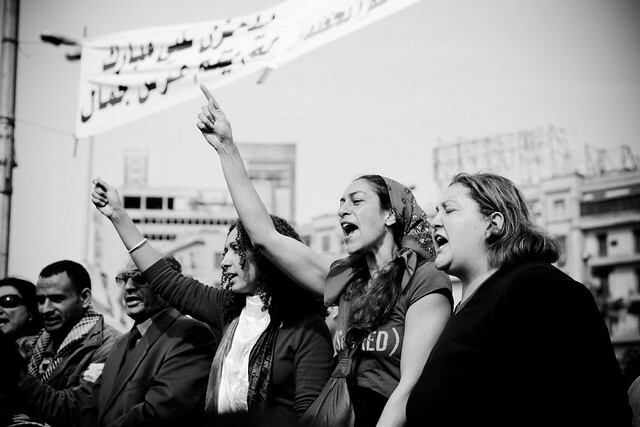 Is there momentum towards protestors taking over the means of production and other institutions of Egyptian society? On the ground, organizing mechanisms are evolving slowly. Protestors have set up security committees to watch the exits and entrances to the square and to defend it from attacks by Mubarak’s thugs. There are makeshift hospitals that have also been erected in the square to treat the injured form the clashes with the thugs. Discussions continue in circles that the protestors have put together in order to try to reach some unified demands and people take the platform where there is a mic and address the protestors. Whatever resolutions that the people like they cheer and whatever they don’t like they boo. The uprising up until now contained elements from all Egyptian society, whether it is the urban poor, the working class, and even sons and daughters of the Egyptian elite could be seen in the protest. But as the revolution continues, some polarization has started to happen naturally. Between those who are tired, meaning the middle class and the upper middle class who are saying that we should stop now and try to reach some compromise with the government, and those who basically have nothing to loose and who have sacrificed a lot, like the urban poor and the working class. The intervention of the working class in the movement is also another question mark, because definitely in some of the provinces where mass protests were organized they contained a majority of workers. But we still haven’t seen an independent movement by those workers. Except in very few cases. For example I received a report about a textile mill owned by a company called Ghazl Meit Ghamr in Daqahliya, which is a province in the Nile Delta. The workers there have kicked out the CEO, they have occupied the factory and are self-managing it. This type of action has also been repeated in a printing house south of Cairo called Dar El-Ta’awon. There as well the workers have kicked out the CEO and are self managing the company. There are two other cases in Suez, where the clashes were the worst with the security forces during the uprising. The death toll is very high in Suez, we don’t actually know the real death toll until now. In two factories there, the Suez Steel Mill and the Suez Fertilizer Factory, workers have declared an open-ended strike until the regime falls. Other than that we have not seen, at least to my knowledge, independent working class action. The last thing i would like to note is that the so-called popular committees have been springing up in the neighborhoods here in Cairo and in the provinces. This happened following the collapse of our police force and their cowardly withdrawal in front of the people last Friday [January 28th]. The government started whipping up the security paranoia amongst the citizens in addition to sending plainclothes thugs who were affiliated with the security services, just as it happened in Tunisia, to attack public and private property and fire shots in the air. Citizens immediately stepped in and started forming these popular committees to protect their neighborhoods. They have set up checkpoints, they are armed with knives, swords, machetes and sticks and they are inspecting cars that are coming in and out. In some areas, such as the province of Sharqiya, the popular committees are more or less completely running the town, organizing the traffic etc. But in many cases they also work in coordination with the army. 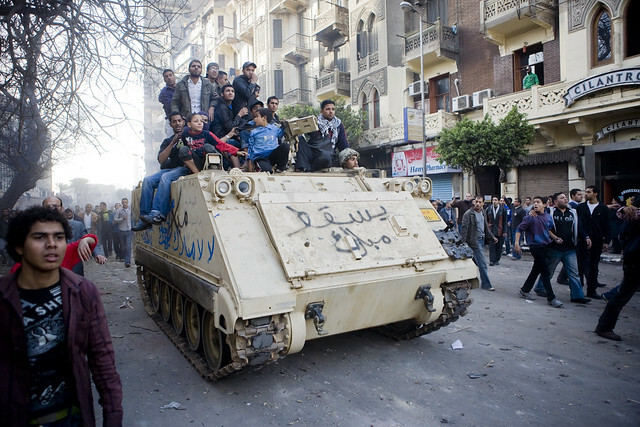 The army has played an important role in the uprising in Egypt, even receiving support from the US. Can you explain the role of the army amidst the protests? Our army as you probably know is the biggest army in the Arab world. It receives 1.3 billion dollars from the USA every year. The military institution has always been the ruling institution we have in Egypt, even if our President hasn’t put on the military uniform since 1952. Their intervention by descending on to the streets on the night of Friday, the 28th of January, was based upon the order from the chief of the army, who at the end of the day is Hosni Mubarak. When the army first appeared in the streets they were positively welcomed by the people since the police is hated much more than the army here in Egypt. One reason is that the army does not have much contact with the civilians on a daily basis, unlike the police of course. Since people were sick of the police and paranoid of the security situation they initially welcomed the army to the neighborhoods and also to the entrances and exits of Tahrir Square. However we all know that, number one, the army can’t be trusted and number two, that when you hear Obama and the US administration coming out strongly in favor of a power transition supervised by the Egyptian military you understand what their role is in keeping Egypt stable. Specifically making sure there isn’t a radical regime that could threaten the security of Israel, the security of the Suez Canal and the continuous flow of oil. The US administration itself has probably made a fool of themselves for the zillionth time owing to their position vis-a-vis the Egyptian revolution. Initially when the protests started HIllary Clinton immediately announced that they were not worried whatsoever and that the Mubarak regime was stable. And Joe Biden went on air and refused to label Mubarak as a dictator. Why? Because Mubarak is a friend of United States and a friend of Israel. This shows you the hypocrisy of the Americans when it comes to their barometer of who is a democrat and who is not. And now when they have finally reached the conclusion that Hosni Mubarak was to be overthrown, they are working day and night in order to secure his removal as smoothly as possible. Cross-national inspiration was crucial for the wave of uprisings that we are witnessing, has there been the emergence of networks of coordination across Arab nations that are continuing and can pose as a viable alternative to the political landscape we see today? The domino effect was definitely evident after the uprising in Tunisia. When Ben Ali was overthrown this was very much positively received by Egyptians who could draw parallels between the Tunisian situation and the Egyptian situation. There were also several protests that had already broken out in solidarity with Tunisia. The main slogan chanted in Tahrir Square and around the country is “El-Sha’ab yourid isqat el-Nizam” . This was the same slogan chanted by the Tunisians, “The people want the government to fall.” It is true that in the days leading unto the uprising there was much discussions over the internet and Tunisian activists were transferring some of their experiences when it comes to confronting the police, such as activist kits you should have with you when you are facing the police. But we don’t have any concrete mechanisms for coordination yet. All we get are tweets and emails saying “solidarity”, “we like what you are doing”, “you are a source of inspiration” etc. But i’m afraid that there aren’t any governing or coordinating mechanisms between these two movements yet. How will this develop in the future no one knows but I am personally hoping that this will be the start of something bigger. Because already the domino effect is spreading. You’ve seen Yemen. They have had mass protests against their dictator, who had to come out promising not to run again in elections and not to groom his son for succession. There were similar protests in Jordan and the King was quick to intervene and dissolve the cabinet and bring in a new one. There was already a mini-uprising in Algeria even before Egypt, which was put down brutally by the usual force of the Algerian state. But they have also had to make concessions , they removed the emergency law and they lowered the prices of basic commodities. It is still to early to judge, the uprising here is only 12 days old, in Tunisia it took one month. We’ll see how it goes. Unable to find a job after university, Muhammad Bouazizi, moved to a big city and sold vegetables on the streets. But police confiscated his unlicensed cart, and slapped and insulted him. The 26-year-old returned to his home town, Sidi Bouzid, and on 17 December stood in its main square, doused himself in petrol and set himself on fire. He died of his injuries on 4 January. 1736: Two sources close to the government confirm to the AFP news agency that President Ben Ali has left Tunisia. 1735: Air France has temporarily suspended all flights to Tunis due to the state of emergency and the closure of air space. 1733: Sources tell al-Jazeera TV that President Ben Ali has left the country and that the army is in control. 1732: Saudi-based al-Arabiya TV reports that Tunisian Parliamentary Speaker Fouad Mbazaa will announce shortly that he is taking over control of the country from the president. 1724: Sources tell al-Jazeera TV that the Tunisian security forces have arrested members of Trabelsi family at an airport. Many of the protesters have expressed their anger at the power, wealth and influence of the extended family of President Ben Ali’s second wife, Leila Trabelsi. “No, no to the Trabelsis who looted the budget,” has been a popular slogan. Many refer to the president’s relations simply as “The Family” or “The Mafia”, according to the New York Times. 1705: State television says a major announcement to the Tunisian people is to be made soon, according to the Reuters news agency. 1654: The Tunisian authorities have released Hamma Hammami, the leader of the banned Tunisian Workers’ Communist Party (POCT), three days after arresting him, his party tells the AFP news agency. 1646: A source at Tunis Carthage airport tells the AFP news agency that the army has taken control there and that the country’s airspace has been shut down. 1628: BBC Monitoring reports that emotions ran high in one debate on Tunisian TV7, in which one of the pundits screamed: “People are being shot dead with live ammunition. How can you praise the president?” He then turned to the camera and said: “Ben Ali, as you know him, is dead.” The debate was immediately cut short. Shortly after, a TV technician sat in the studio, next to the newsreader, and went on apologise to the public and condemn his own channel’s coverage of events, saying they were government employees and they were doing what they had been asked to do. 1617: The government has also warned that “arms will be used” if the orders of the security forces are not obeyed. 1615: Under the terms of the state of emergency, the government has banned any meetings outside of more than three people, according to state television. There will also be a nationwide curfew from 1700 (1600 GMT) until 0700 (0600 GMT). 1551: UN human rights spokesman Rupert Colville says it is ready to help investigate the reports that more than 60 protesters have been shot dead by the security forces in the past week. “We’ve made it clear we believe there needs to be investigations. A large number of people have been killed and there are very serious allegations of the manner of these killings,” he tells reporters in Geneva. 1544: There have been violent clashes between protesters and the police in the centre of Tunis, according to the AFP news agency. 1523: Prime Minister Mohamed Ghannouchi says he has been tasked with forming a new administration. 1521: President Ben Ali has dismissed the government and called legislative elections within six months, state television reports. 1518: The government has put the death toll at 23, but the Paris-based International Federation for Human Rights said on Thursday that it had the names of 66 people killed. 1454: Thirteen civilians were shot dead by the security forces in Tunis and its suburbs in clashes on Thursday, medical sources tell the AFP news agency. Reuters meanwhile says 12 died – 10 in the capital and two in the coastal town of Ras Jebel. Tunisian officials have not yet commented. It is not clear if the deaths came after President Ben Ali ordered police to stop using lethal force against demonstrators. 1447: Dubai-based al-Arabiya TV says protesters are trying to “storm” the Central Bank in Tunis. The bank is on Avenue Mohamed V, to the north of the interior ministry. 1426: Protesters have been sent fleeing down Bourguiba Avenue by the volleys of tear gas fired by riot police outside the interior ministry. The Reuters news agency say a crowd of youths have begun retaliating by throwing stones. 1408: Tunisia’s ambassador to the UN’s cultural organisation, Unesco, has resigned in protest at the government’s handling of the unrest, according to a letter seen by the AFP news agency. Mezri Haddad told the president that he had asked him to “stop the bloodbath by disarming the police”. “I told you that the protesters are not against you but against the oligarchy to which you have fallen hostage and which has plundered the country’s riches without cease,” he added. 1402: A reporter for the Reuters news agency says gunshots have been heard near the interior ministry building. President Ben Ali said on Thursday that live ammunition would not be fired at protesters. 1355: Tear-gas canisters have been fired by the security forces at protesters outside the interior ministry, forcing many to flee. The Associated Press reports that the move came after people climbed on top of the ministry’s roof. The demonstrator sare surrounded by dozens of police and soldiers. 1334: Jalloul Azzouna, the secretary-general of the League of Writers, a non-official body, tells reporters at the Tunis protest that it is demanding “a general amnesty and the release of hundreds of political prisoners whose existence is denied by the regime”. 1321: It was the death of a young unemployed graduate which triggered the protests. Unable to find a job after university, Muhammad Bouazizi, moved to a big city and sold vegetables on the streets. But police confiscated his unlicensed cart, and slapped and insulted him. The 26-year-old returned to his home town, Sidi Bouzid, and on 17 December stood in its main square, doused himself in petrol and set himself on fire. He died of his injuries on 4 January. 1313: Demonstrations are also being held in other towns, including Sidi Bouzid, where the unrest began a month ago over unemployment and food prices. People there are demanding the president resign. “We have come out in our thousands to say: ‘Ben Ali, go away! '” trade union activist Sliman Rouissi tells the Reuters news agency. 1309: Radia Nasraoui, a lawyer at the protest in central Tunis, tells the Reuters news agency: “We want Ben Ali to go. All we’ve known since he’s been in power has been misery, prisons, torture, repression and unfair trials. I’m a lawyer. I’ve been assaulted. I see traces of torture every time I meet people in Tunisian prisons. There are only unfair trials. People are sentenced to dozens of years for political opinions. People have died under torture in the interior ministry.” Her husband, Workers’ Communist Party leader Hamma Hammami, was arrested on Wednesday and has not been heard of since. 1303: The BBC’s Aidan Lewis says a new generation of activists has been credited with driving the Tunisian protest movement forward by using the internet. This has happened despite increasingly strict controls by a government that, even before the demonstrations, was regarded as unusually zealous in its online censorship. A steady flow of protest videos, tweets, and political manifestos has continued to make its way onto the web in a variety of languages: Arabic, the Darija Tunisian dialect, French and English. 1256: Tunisian medical officials tell the Associated Press that 13 people have died in new unrest in the country. 1137: The AFP news agency reports that demonstrations are also taking place in other towns across the country. 1119: The march was organised by Tunisia’s only legal trade union, which also called a symbolic two-hour strike in the capital on Friday. 1108: The BBC’s Adam Mynott in Tunis says: I have been told there are 6,000 or 7,000 people here. The rally is surrounded by dozens of police and soldiers, but crucially they have not so far intervened as they have in recent weeks. 1106: After President Ben Ali announced on Thursday night that he would not seek an extension to his term of office and other measures to appease protesters some people celebrated on the streets of Tunis. It is not clear if this was a spontaneous act or a celebration arranged by the followers of the president. However, correspondents say his promise to stop the security forces firing live ammunition at protesters, to cut the price of basic foodstuffs and free up the media in Tunisia do go some way to meet the concerns of protesters. 1101: In a nationwide address on Thursday, the president said he would not stand for re-election in 2014 and announced cuts in the prices of basic foods. Foreign Minister Kamel Morjane has since spoken of a national unity government being possible – as well as early parliamentary elections. The protests erupted a month ago over economic problems and the lack of basic freedoms. 1100: There have been renewed protests against the government in Tunisia. Thousands of people joined a march in the capital, Tunis, demanding that President Ben Ali resign immediately. The protesters went to the interior ministry, which is blamed for the deaths of at least 23 people in recent demonstrations. Human rights groups say the number killed is more than twice that official figure.